Fostering productive discussions on contentious topics. Katie Dulaney listens as her students have a discussion. When teacher Katie Dulaney learned about The New York Times’ Civil Conversation Challenge just prior to the 2016 presidential election, she got excited. For weeks her eighth graders at the Franklin School of Innovation, an EL Education (formerly called Expeditionary Learning) middle and high school in Asheville, North Carolina, had been studying how the nation’s founders grappled with and debated the principles they ultimately wrote into the Constitution. The challenge invited students to post letters in an online dialogue about contentious contemporary issues. Dulaney knew that crossing ideological, cultural, and regional divides to argue with other students across the country would give her students a chance to step into the founders’ big shoes. Over the next four weeks, Dulaney’s students wrote more than 600 impassioned letters on immigration, gun control, climate change, and civil rights. They posted their letters digitally and wrote back to other students who had responded to their letters. At the end of the challenge, Dulaney’s students were recognized by the editors at the Times for their extraordinary participation, intelligent comments, thoughtful questions, and the way they “politely pushed back to ask others for more evidence, or to point out inconsistencies.” How did Dulaney cultivate the art of civil conversation in her classroom and in print? 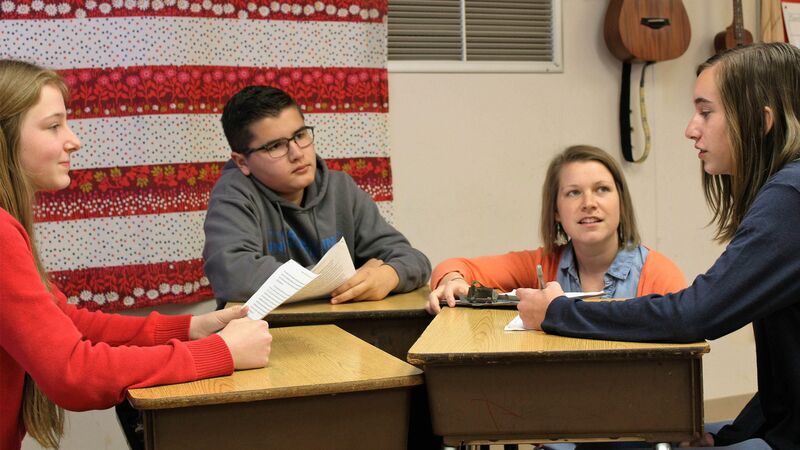 Here are five tips for getting students to grapple productively with hard issues. Before debating in a public forum, students analyzed historical presidential debates. They noticed that in recent years, the debates were more heated and polarized, and candidates often didn’t actually respond to the questions. Students decided that in their own debates, they would try to respond to their opponent, rather than just state an opinion. “Perhaps the most important thing students learned about civil conversation,” said Dulaney, “is that putting their arguments on paper forced them to slow down, to consider why they believe as they do, to acknowledge their opponents’ arguments, and to check their reactive impulses.” Dulaney critiqued model letters with her students and taught them to use a peer critique protocol to give kind, helpful, and specific feedback on their writing before revising. Arguing with both passion and compassion is the essence of a civil conversation—and, as the founders knew, the heart of citizenship and democracy. If that’s a message you want to share with your students by putting these five tips into action, look for opportunities for students to debate with classmates, in your local opinion pages, or in online venues like the daily student opinion column published by The New York Times.